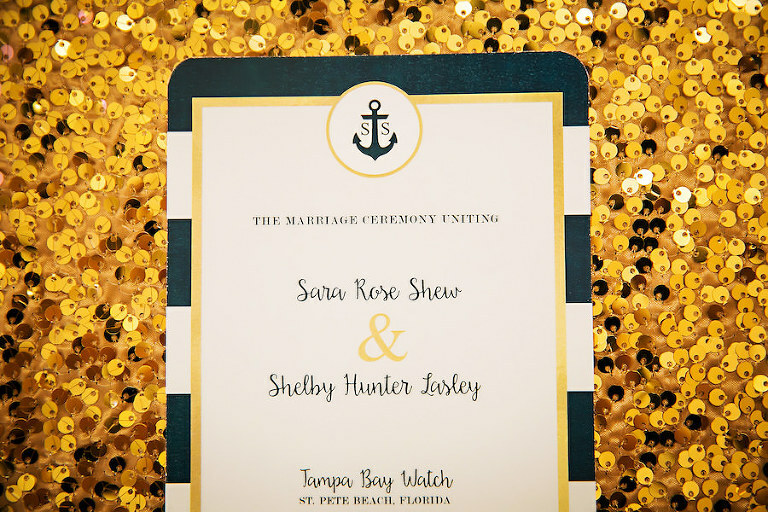 Sara and Shelby’s destination waterfront St. Petersburg wedding featured a nautical, chic theme with a navy, gold and blush pink color palette. The Indianapolis couple chose the St. Pete area because their parents and siblings live nearby. 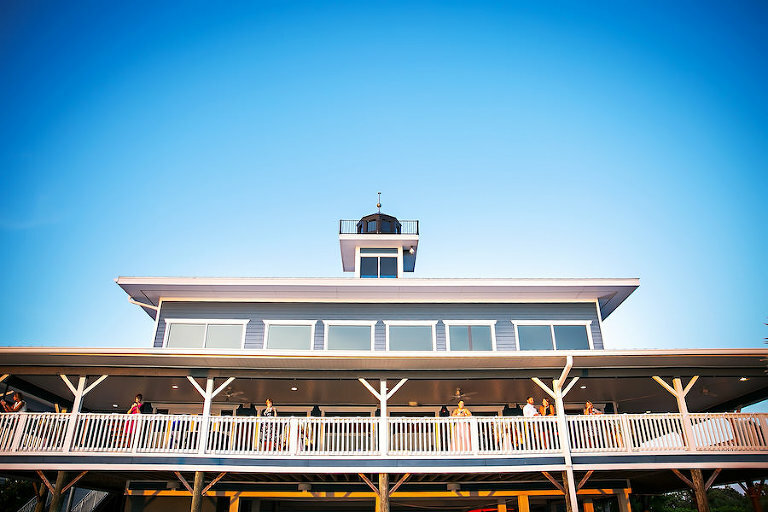 “I had always dreamed of a destination wedding, and we were both familiar and had ties to the area, so Tampa Bay was perfect!” Sara gushed. Since they were planning a wedding from hundreds of miles away, the pair hired St. Petersburg wedding planner Special Moments Event Planning. Amazing wedding photography was a priority to the bride and groom. Looking back, one of the bride’s most memorable moments was having her dogs make an appearance in her wedding portraits. “It was really special to us to have them be there, even for just a short time,” Sara reminisced. Nautical chic. 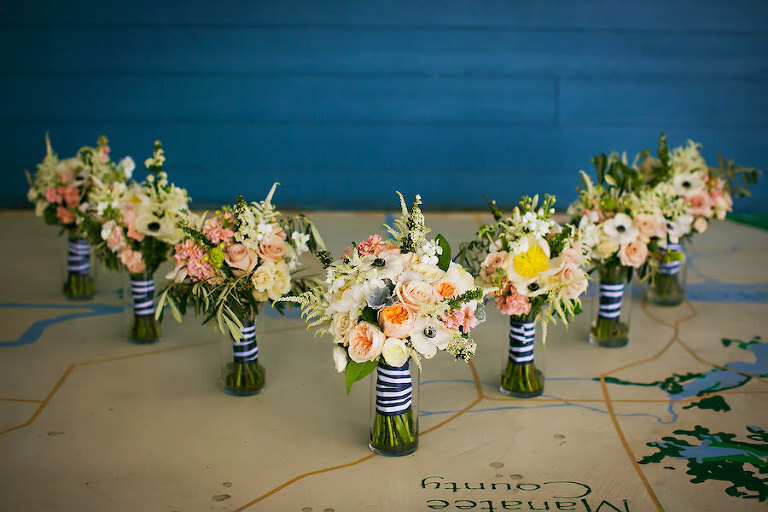 Being that we, and most of our guests, are from Indiana, I wanted to make sure that we incorporated a nautical vibe, but I still wanted it to have a more elegant tone. Navy, gold and blush pink. Navy is key to creating the nautical theme. I thought the gold and blush helped to tie in the chic factor. Also all are very summer-y! I am a huge animal lover. Shelby and I went on a trip to Australia, and he arranged a private tour of an animal sanctuary and a cuddle session with a koala bear! He proposed there. A proposal, in Australia, with a koala bear! It was my bucket list all rolled into one! Someone with solid experience in planning weddings and who also had plenty of knowledge of the area and local vendors. Tammy of Special Moments Event Planning and her team had just that, many years of solid experience with planning weddings and a thorough knowledge of local vendors. As someone planning a destination wedding, those factors are key. Tammy already had a lot of great insight to our venue and knew where to go for quality vendors, instead of me having to do tons of online searching. Even the day of the wedding, I wasn’t worried because I knew I was in good hands with Tammy and her team! Photos are one of the most important pieces to your wedding day, so we wanted to find the best. 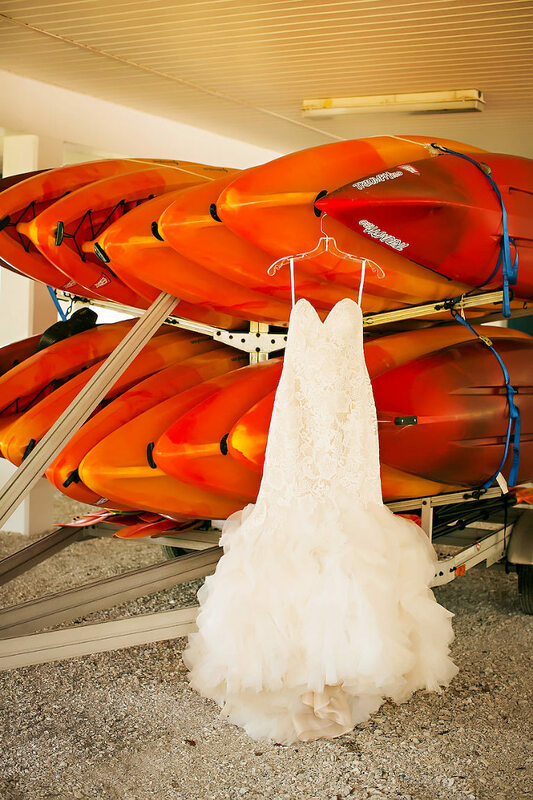 We hired Limelight Photography because their photos stood out among all the others. Their quality is exceptional. I am forever thankful that we hired Limelight for our wedding; they truly are the best!